The weekend has come to a close, and I’m practising a little bit of mindfulness. The opportunity to sit and just think is so cleansing and refreshing for me that I think I should do it more. 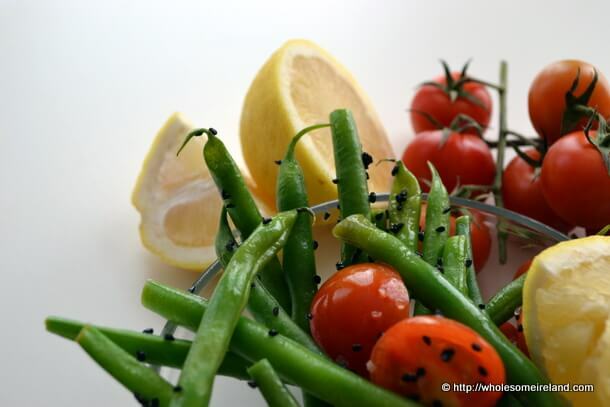 It’s not just that I’m working on my mind, I’m paring back many of my favourite recipes to simple, clean flavours that work like this green bean salad. Yesterday was the Easyfood Homecook Hero Awards in The Shelbourne in Dublin. It’s easy for me to remember the time of the year they’re on because they always fall in or around my smallest boy’s Birthday. It’s so memorable because just 2 short years ago when he was only 10 days old I ventured into Dublin with my Mam for an extra pair of hand & tiny baby in the buggy to compete. I remember the moment when I realised that I could follow my food dream and juggle the boys (with help obviously). When I felt like I was at home amongst people who understood what it was like to obsess about food, dream about it, how it should be plated, how recipes should read and how food should taste. There have been so many milestones in my food (and writing) journey since this weekend 2 years ago. As I often say to many of my fellow Irish Parenting Bloggers; celebrate all the milestones because if you don’t, no one else will. In which case today I’m grateful for the readers, listeners, fans and more. For the people who see beyond this blog and understand that it’s not just about sharing how we live on a budget, it’s about dragging ourselves kicking and screaming out of this blooming recession. It’s about the “whole sum” and not just being “wholesome”. Put a medium sized pot of water on to boil. Trim the tops, not the tails, of the green beans off. Add to the boiling water and boil for exactly 2 minutes with the lid off the pot. Move the pot directly to the sink and run the cold tap into the pot until the beans are cold. Slice the tomatoes. In a dry frying pan on a high heat, toast the nigella seed until they begin to gently “pop”. If you like extra protein source you can also add flaked or nibbed almonds at this stage to toast. 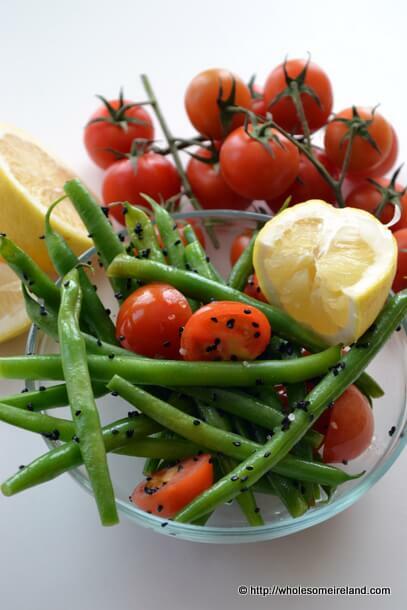 Toss the cold green beans with the warm seeds and sliced tomatoes. Liberally squeeze lemon juice on top. Normally at this point I say season to taste but a decent sea salt sprinkled on top completes the dish. One of the few times where salt is compulsory in my book!